and 3.3V and 1.2V regulators. In a nutshell, a great I/O capability and nothing-to-sneeze-at size for your designs, for the low, low price of 13.99 USD. What you won't get though, is an in-depth documentation with example programs showcasing all the features of the board. There is however the board schematic available and a simple Blinky project, that assumes an in-depth knowledge of the Lattice tool chain. This tutorial will only use open source tools that you can conveniently run from the command line. If you're one of those people that prefer heavy UI-based solutions in the likes of Xilinx ISE, you probably want to follow this tutorial instead. yaourt -Sy apio     # For Arch Linux. pip install -U apio # When in doubt, you can install it this way. apio init -b upduino2 -p .
The program defines a module called blinky that uses our three LED wires that we've mapped to the correct (trust me) pins of the chip package. The blinky module then proceeds to connect the clk signal to the internal high-frequency oscillator (line 6), which it then uses to define a very simple 27-bit counter called counter. On each positive edge transition of the clk signal (which is our internal, high-frequency oscillator, mind you) the counter will add 1 to its value. Lastly, the three most significant bits of the counter are then connected to blue, green and red LED signals respectively. Upon execution we expect the counter to keep incrementing eventually changing the three most significant bits and, in turn, changing the three different LED colors. apio verify # Verifies the correctness of the Verilog code. apio build  # Compiles the code & prepares a bitstream ready for uploading. 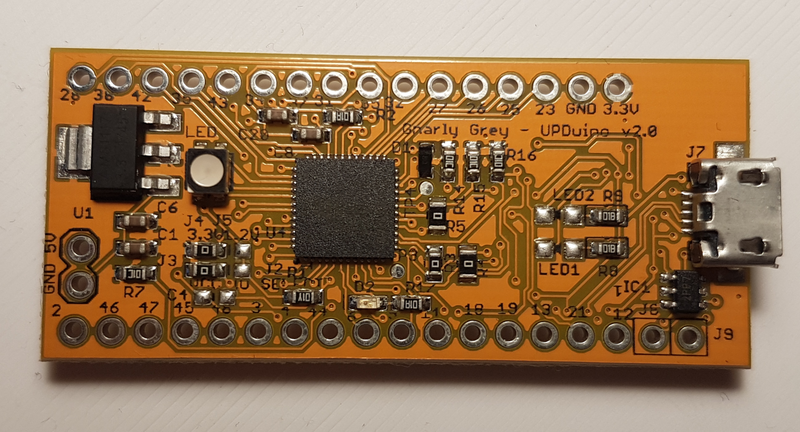 apio upload # Uploads the bitstream to the board. If everything went according to the plan, your Upduino will now start very slowly increasing its temperature until it reaches the temperature of a TOKAMAK fusion reactor and burns down your house. You. Are. Welcome. Obviously, the previous example isn't ideal - the LED is not current-limited resulting in the whole board getting uncomfortably warm to the touch. Also, if you are wondering about the SB_HFOSC thing in the code, and why it needs to be there, you are not alone, I was pretty confused as well when I tried piecing some working examples together. Let's tackle these problems one by one. The SB_HFOSC is a Lattice-supplied module that is conveniently doing a lot of niceties for us - it connects the wire that we give it to the internal high-frequency oscillator, and the sixth line of the previous example just istantiates that module. Of course, there are more of these convenient pieces of code that are waiting for you to explore and re-use in your designs - it's like a standard library of sorts. This time we're instantiating two modules - SB_HFOSC for the oscillator and SB_RGBA_DRV for the RGB LED driver. In order to switch the LEDS we're using the PWM-enable signals (RGB#PWM parameters) to turn them on and off according to the state of the counter. Additionally, we're configuring the "half-current" mode (setting the CURRENT_MODE parameter to 1) and setting the lowest possible current values (RGB#_CURRENT parameters), namely 2mA, per LED. The LED should now cycle through different colors without getting excessively hot in the process. That is, assuming that you didn't burn your house down by this point. A working Blinky, that I found very useful in figuring out how to run stuff successfully. Oh, an you can find the code here. Happy hacking. 2019-04-01: Fixed a bug in the improved version of the blinky and added a link to a Git repository of the code.